This luxurious pillow top mattress presents a unique 9-Zone support system, divided into comfort zones designed specifically for different areas of the body. The middle of the mattress features increased contouring to support your hips, while the head and foot are maximized for airflow and softness. Luxurious memory foam comfort layers form to the exact shape of your body, facilitating proper spinal alignment and reducing pressure points. The sumptuous pillow top design delivers all the cushioning softness you crave. Incorporated in the mattress quilting, bamboo fiber contributes extra coolness and breathability at the surface. This mattress is made with natural, renewable, and non-toxic materials, making it a safe and healthy choice for your bedroom and for the planet. 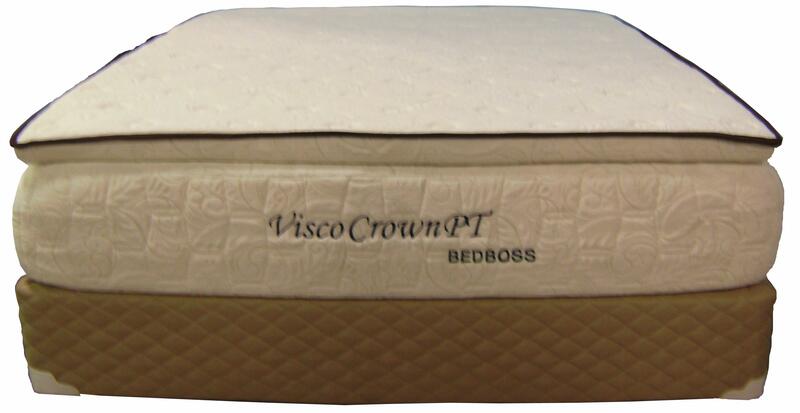 The Visco Crown Queen Pillow Top Memory Foam Mattress and Foundation by Bed Boss from Nashco Furniture - Nashville. We proudly serve the Nashville, Franklin, Brentwood, Clarksville, Green Hills, Davidson County, Williamson County, Tennessee area. Product availability may vary. Contact us for the most current availability on this product. 13Q Queen Memory Foam Mattress 1 13"
Top Soft Blended Bamboo Cover with Aloe Vera Treatment and Circle Stitch, Quilted with ½" Cooling Bamboo-Infused Memory Foam. Devoted to bringing you a healthier night's sleep using natural, renewable materials, memory foam mattresses by The Bed Boss are a great choice for the eco-conscious consumer. Highly conforming Visco memory foam is complemented by bamboo, Aloe Vera, and castor plant oil, each doing its part to bring you a cool, comfortable, and sustainable sleep surface. Available in a variety of styles and comfort levels, Bed Boss mattresses are carefully designed to meet your unique needs. Foams used in The Bed Boss mattress line are CertiPUR-US® certified: tested and approved by an independent laboratory to meet rigorous environmental, health, and safety standards. CertiPUR-US® certified foams are free of harmful CFC's, mercury, lead, heavy metals, formaldehyde, prohibited phthalates, and toxic flame-retardants. Indoor air quality is protected with low emissions (low VOC's). The Visco Crown collection is a great option if you are looking for Mattresses in the Nashville, Franklin, Brentwood, Clarksville, Green Hills, Davidson County, Williamson County, Tennessee area. Browse other items in the Visco Crown collection from Nashco Furniture - Nashville in the Nashville, Franklin, Brentwood, Clarksville, Green Hills, Davidson County, Williamson County, Tennessee area.